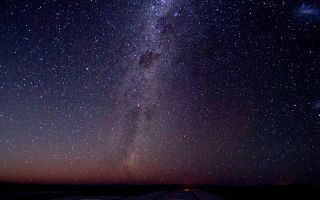 The Milky Way shines in all its majesty, as well as the Magellanic Clouds on the right. at the European Southern Observatory's Very Large Telescope. In this space wallpaper, the Milky Way shines in all its majesty, as well as the Magellanic Clouds on the right, at the European Southern Observatory's Very Large Telescope in Chile.